Remember when we used to go to Paris for the weekend from Manchester? 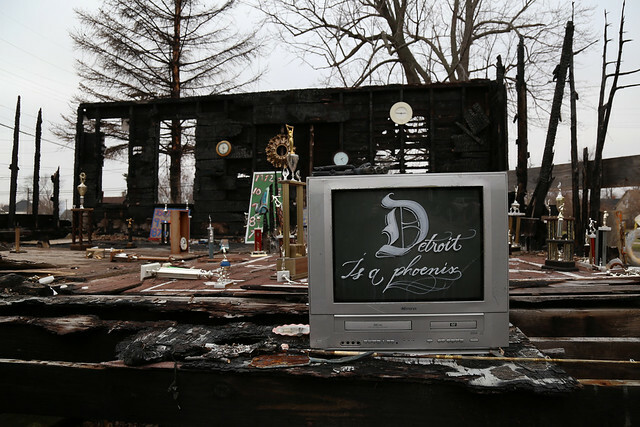 Well now we go to Detroit. 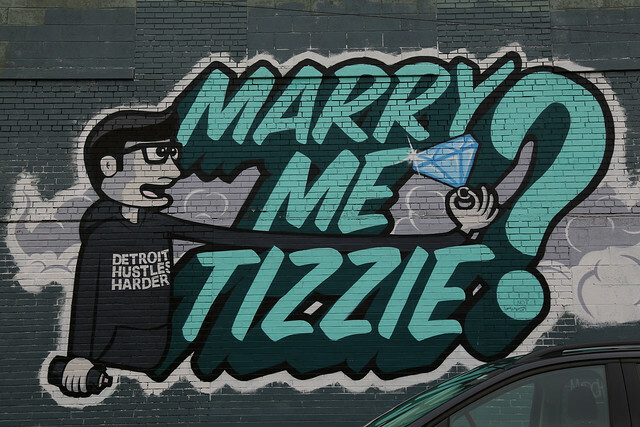 This joke got some chuckles before our weekend trip to Detroit and ironically enough I look back and consider my little gem ignorant and snobbish. This was a lovely learning experience and a reminder how silly it is to create opinions out of thin air. We have to thank our partners in crime, Mr. Ball-Time and Mrs. Love-Gilmore-Girls for suggesting it and making it happen. 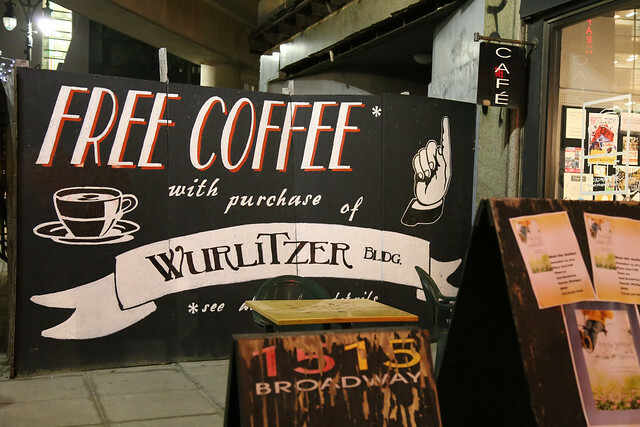 We are at times food snobs, so we avoided the hotel breakfast and chose The Rowland Café in the Guardian Building. This was the first stop during the weekend and as we walked around downtown on Saturday morning, it is the opposite of downtown Toronto with people rushing from one place to another. There is a feeling of an empty movie set, something similar to what we experienced in Christchurch. And then you get caught off guard when a street cleaner says ‘Good morning’, not the expected behavior in the famed scary Detroit, not even regular downtown behavior. Maybe they knew we were tourists and they were putting on a show. I am sure that is it. While snooping around a Made in Detroit shop those sneaky Detroitians offered free tours of the building. A gentleman came in and talked to us for a bit more than an hour about the history of downtown and the buildings around. 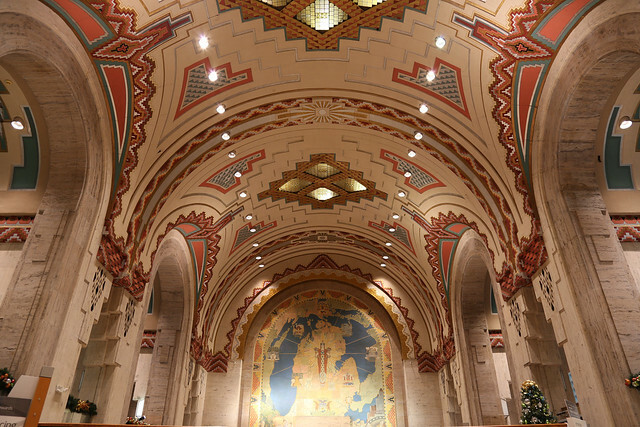 A quick summary: the Guardian was architected by Wirt Rowland, and it has works by Corrado Parducci, muralist Ezra Winter with an inside covered in Pewabic Tiles, locally sourced. The guide also recounted that at the time of construction the artistic direction was moving from European influences to native art motifs as well as inspirations from all the Egyptian archaeological discoveries taking place at the time. Classed as an Art Deco building the attention to detail is impressive, even the furniture pieces were designed to fit the overall feel of the building, creating the financial cathedral it was meant to be. 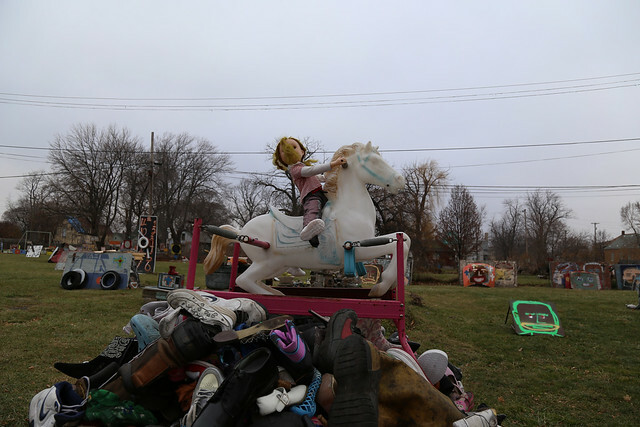 The drive towards the Heidelberg Project snaps you out of the protected shelter of Pewabic tiles and shows you harsher realities: deserted houses, some burned down houses and even sadder, houses which you think are deserted but are not. 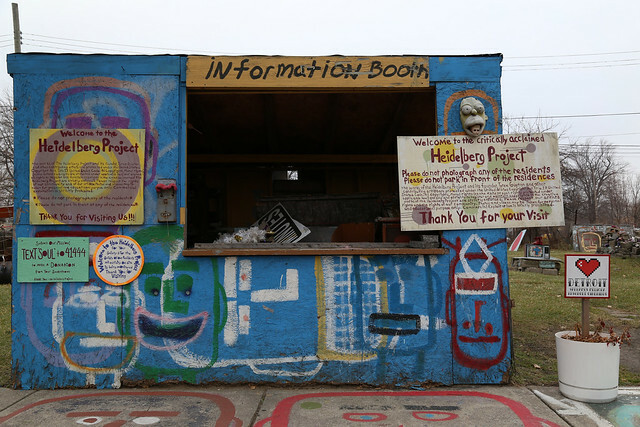 The site of the Heidelberg Project is incredible, unlike anything I have ever seen. 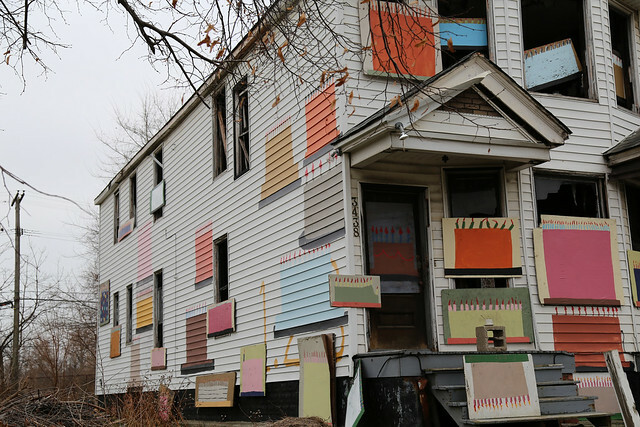 Started in 1986 by Tyree Guyton it opened the doors of creativity, started healing through art and it grew over the years to span over multiple houses. Each one is a little universe of its own with different themes. Unfortunately some of them have been burnt down within the last months. Initially we thought that is how it was set up; even though burnt, they still provoked emotions. 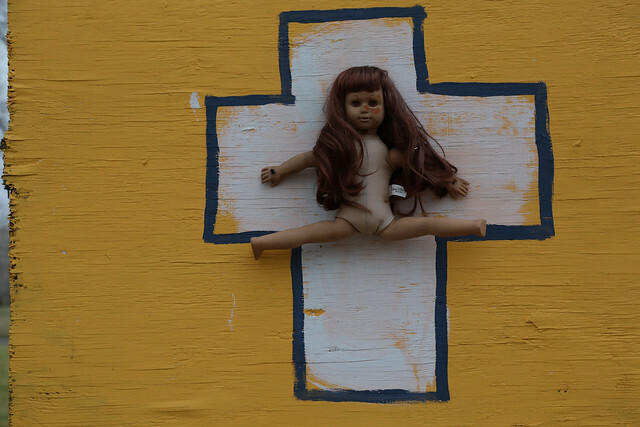 I could spend hours walking around and finding metaphors in all the installations, if not that, then just admiring what miracles you can do with day-to-day objects. From Duchamp’s toilet to bring us all the comfort of art expression, this is an extraordinary extension of that seed. Now, hundreds of photos later I am itching to create some prints from my little Etsy shop. Before that will need to contact the project and get permission so will keep you posted how that advances. The day could have ended there and I would have been happy, but it continued with an afternoon around the Eastern Market through antique sales and even a bit at the market itself. 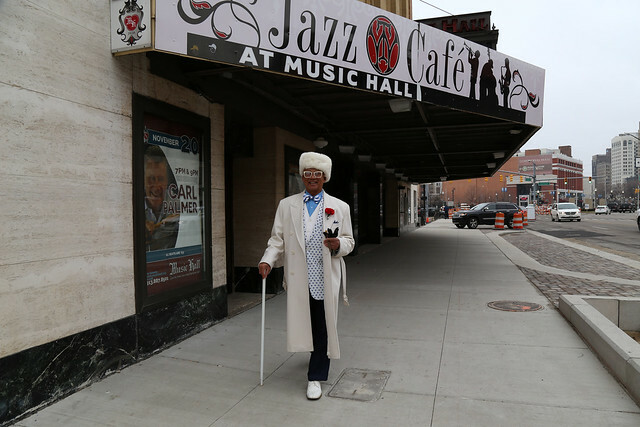 And you know those dangerous Detroitians, well … during the morning tour our friends met a gentleman very keen to share information about the best spots an he recommended visiting the market. Here he was again ready to take us to a marvelous print shop. We were in Detroit less than 24 hours and we already bumped into friendly acquaintances. 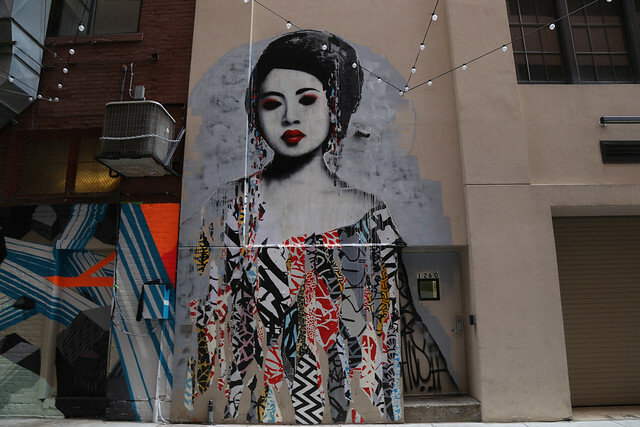 Another attraction in the area is the multitude of street art around. There were no tours of the theatre available during the weekend we were there, so we bought tickets to see a show as an excuse to go inside. I will not name the entertainer and I am usually very forgiving with live performances but the whole show would have been well suited in a 5-minute YouTube video. 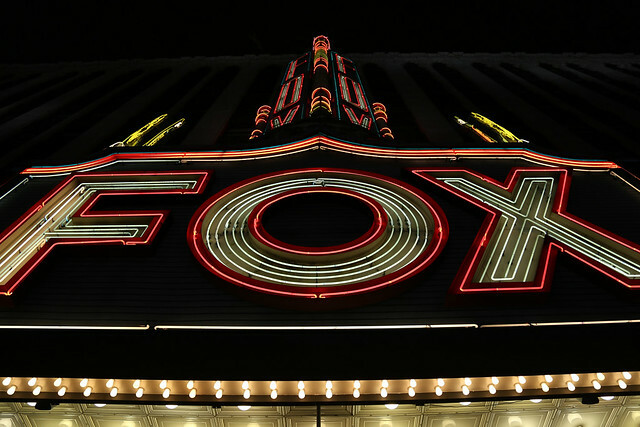 It brought me great excitement to wait outside in line with everyone else, looking up at the letters of the FOX Theatre coming on and off. 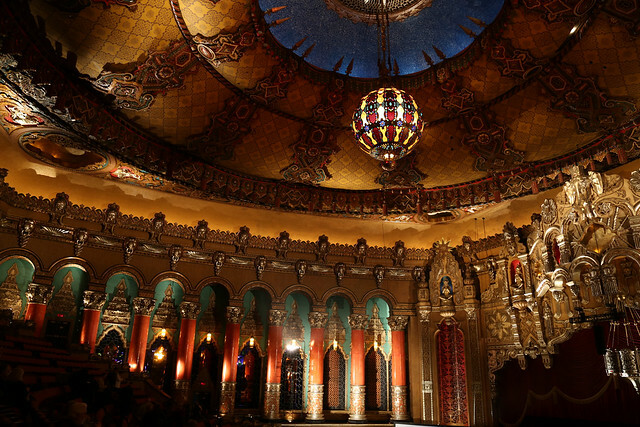 The inside is majestic with colorful Burmese, Chinese, Indian and Persian influences. While collecting guides before the trip I read that there was a thought to sell their art pieces to help the city come out of bankruptcy. I didn’t really grasp how much difference that would make until we entered the Detroit Institute of Arts. There is no lack of free-guided tours and if there is anything I love more than buying uncomfortable things to carry back home, that is a guided tour. An Impressionist explosion in Detroit, a Diego Rivera court and many more pieces we didn’t have time to see. Also a local photography exhibition to remind you that while we come, visit, take photos, use terms like urban decay and analyse capitalism, at the end of all this rhetoric people are holding on and working hard to improve their lives, looking for ways to brighten the future of their kids and to foster a feeling of community. 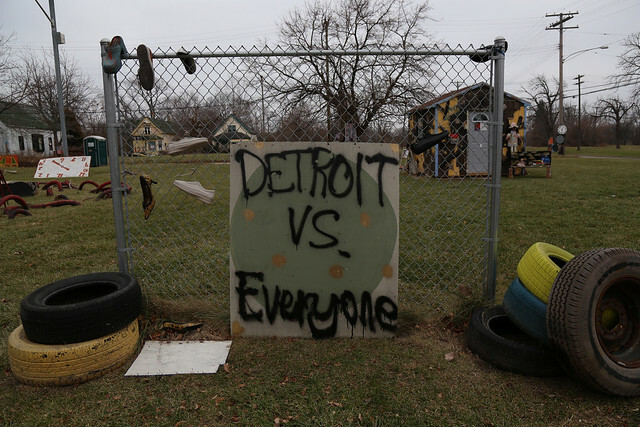 In one of the photo captions we read about a school where the curriculum includes topics specifically related to Detroit, aiming to nurture a wish for the kids to stay in the city, further their education and build a future there. A lot more to see and I am more than happy to go back soon, hopefully for the Diego Rivera and Frida Kahlo in Detroit exhibition. I was very keen to break the Private Property chains to go in. A lot of the other places we were around had more of a resilient feel to them. This one, unfortunately didn’t and it was a sad note to end our visit on. The Made in Detroit souvenir shop in the Guardian Building is good, you can also find Pewabic Tiles here. We bought a print from a lovely shop in Easter Market at Signal-Return. This trip was one of the most surprising I can remember in a while, going in with so much preconception of how dangerous or bleak it is and to find that sure, sometimes it is but this is not a museum we go to and poke around, this is very much a city in the process of rediscovering itself and find a better future. What we can do to support it is take less photos of the urban decay and more of hard work people put in to revive it, support them before anything else. 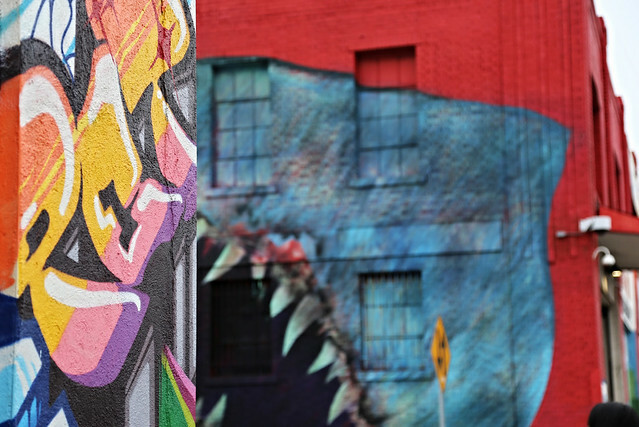 This entry was posted in The Wanderer and tagged Detroit, Heidelberg Project, The Fox Theatre, The Rowland Cafe, Tyree Guyton. Bookmark the permalink.